Even if the month is shorter than most, there are no shortage of happenings at your local Bookmans this February. Whether you live down in Tucson, are right in the middle of things in Phoenix or Mesa, or are still enjoying the last of the winter snows up in Flagstaff, Bookmans stores are the place to be. Why? 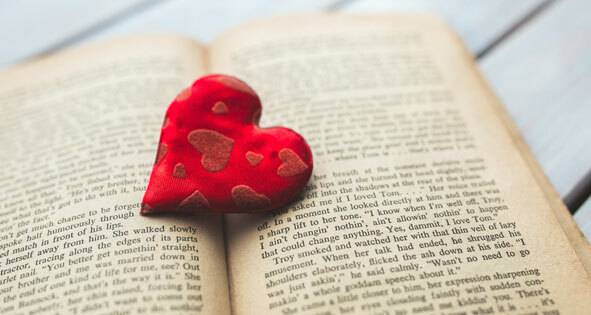 Because we have SO MANY EVENTS coming your way, including our Love of Reading events featuring authors, crafting, and more. Scroll on down to see what’s happening at a Bookmans near you! Have you tried your hand at Dungeons & Dragons yet? If you’re interested in learning how to play, Bookmans’ Tucson stores have 4 upcoming D&D events at East, Northwest (1 & 2), and Midtown. These meet-ups are designed to help new players learn the ins and outs of the game. Video games are always in season at Bookmans, and we’ve got 3 upcoming Super Smash Bros. tournaments. If you don’t want to miss them, be at Bookmans Northwest on Feb 2, at East on Feb 23, and at Midtown on Feb 9. It’s a great gaming event for adults, teens, and kids, and the winners get prizes! To celebrate Rodeo Days, Bookmans Northwest is having a Special Rodeo Days Craftapalooza too. If you haven’t been to Old Tucson Studios’ annual Ted Walker Youth Days, you won’t want to miss them. The fun starts on Feb 7, and Bookmans will be there to educate and play. Stop on over and hang out at our interactive educational exhibit. In conjunction with the El Presidio San Agustin Del Tucson, we’ll have a variety of Spanish colonial toys and brand new toys on hand to show kids how playtime used to look. Kids will also have a blast at the Kids Movie and Craft Night at Bookmans Midtown. This month they’ll be screening the beloved children’s movie The Last Unicorn and making unicorn slime! Adults can get crafty too, and that’s why Bookmans East is having a Studio Nights: Couples Edition painting session this month. Prefer to paint with your friends instead? Mark your calendar for Studio Night on Feb 1 at Midtown. Writers, Bookmans Midtown and East have twice-monthly Writers Unite write-ins for you. It’s the perfect way to get your stories out. Of course, some of us are artists in the kitchen or are at least trying to be. Bookmans East wants to help your love of cooking flourish with their brand new Cookbook Club! Music, sweet music is a staple at our stores and this month we’ve got the Vinyl Preservation Society stopping by Midtown, an International Clash Day trivia and Clash music day at East, and two Acoustic and Ambient Salon Showcases. We’re always dog-friendly, so bring your leashed dogs on down to shake a tail feather with you. Of course, if you don’t have a pooch or cat to jam with, you may just find the furry love of your life at the Meet Your New Best Friend Adoption Day event at Bookmans East on Feb 16! Of course, you may only have one thing on your mind: murder! You’re in luck – Bookmans East has a thrilling night of suspense planned with their Once Upon a Murder Mystery event on Feb 9. To tie our love of reading into the story, participants will be literary characters who may or may not also be the killer! What’s Galentine’s Day? Only the best day of the year! Celebrated on February 13, Galentine’s Day is a day when women celebrate their female friendships. Bring your besties to the free Gal Pal Yoga event on February 13. A Northern Arizona Yoga Center‘s instructor will guide the class into peace and appreciation. We’ll also be at the annual Flagstaff Mountain Film Festival from Feb 14 – 17, so be sure to stop on by and hang out with the local Bookmans team as you enjoy some film culture. If you prefer to get creative instead, Flag has you covered as well. Thoroughly local and amazing Creative Spirits will be hosting the always fun Studio Nights on Feb 21. Musicians Matthew Henry Hall and Craig Yarbrough will be on hand to teach newbies how to play guitar at the Guitar 101 Workshop. Speaking of playing, the first ever Dungeons & Dragons Nights are heading to our Flag store on Feb 5 & 19! Come on down and learn how to play this legendary game with some D&D experts from NAU! Email flagevents@bookmans.com to reserve your seats before they’re gone. Not interested in making Valentine’s Day all about your love life? Then make it all about your friends at the Studio Nights: Valen”date” Your Friends event on Feb 7 at Bookmans Mesa. If you’re an adult looking for another way to bond with your besties and get crafty, join the Phoenix store for their Crafty Hour adult craft event. The instructor will teach everyone how to make no-sew book bags. You can bring your own t-shirt or we’ll provide one for you. Care to spin? Join Bookmans Mesa at HeatSync Labs for their Southwest Maker Fair and MEGA M.E.S.A. spiral art class. Want to make some music instead of crafting? Bookmans Phoenix has a super fun Ukulele Jamboree in store, and so Mesa has a Ukulele Party too! Prefer to learn guitar? Don’t miss the Learn Guitar Workshop with Lorin Drexler at the Mesa store. Guitars and ukuleles not your kind of play? How about joining Bookmans Mesa or Phoenix for a game night? The Arizona Game Fair group will be at the Phoenix store on February 1 for Game Night. Mesa has two board game nights in Feb: an RPG Night on Feb 11 and a Board Game Night on Feb 21. 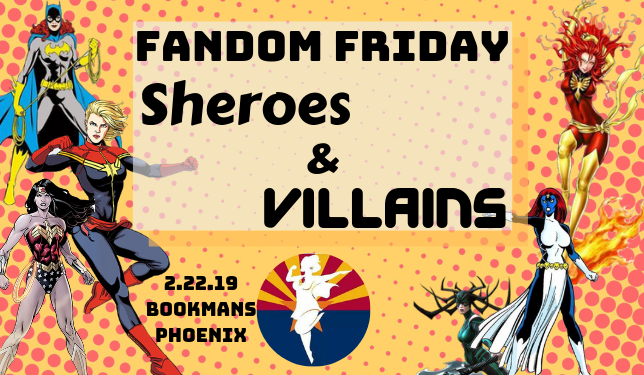 Don’t forget to celebrate your favorite geekdom with Bookmans Phoenix for Fandom Fridays! If you’re heading to Downtown Mesa for Swingin’ Sweethearts, come on over and hang out with the Bookmans crew too. Last but certainly not least, KOAI The Oasis 95.1/94.9 will be at Bookmans Phoenix on February 6 and Mesa on February 8 to give away a pair of tickets to The Rolling Stones “No Filter” concert tour!